**All prices are subject to change. Reserve your spot quickly with your deposit to get this pricing. 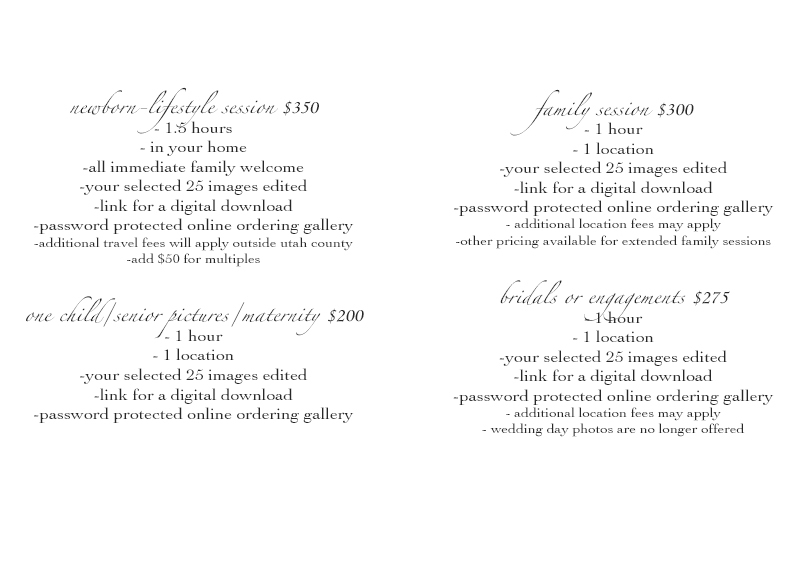 *Location Prices are in addition to your photo package and will be paid by me to their Main Office before you arrive. Old Barn (Mapleton) - FREE. Example here. Utah State Hospital Apple Orchard (Provo) - $20. Example: here. Genola Cherry Orchards (payson)- FREE. Example here. BYU (Provo) - FREE. Example: here. Riverwoods (Provo)- free outside using just their landscaping. Example: here. - $25 inside by their shops or in Provo Beach Resort. American Fork Amphitheater - FREE. Example: here. Wadley Farms (Lindon) - $40 - Example: here. Provo Historic Courthouse - Free before 5pm, after 5pm $35 Example: here. All images copyright Kimberly Aldrich Photography.